I’ll never forget my hometown’s library. I can still remember the excitement of heading down the cement steps into the children’s room, the scent of the card catalogues, and the thrill of graduating to a “grown up” library card, which meant—joy of all joys!–being able to check out more books. It was where I learned about Princess Grace and Amelia Earhart (thanks to the children’s biography section), where I met the March sisters, and where I could find those random Sweet Valley High books that filled the gaps in my collection. I loved that library, and as National Library Week kicks off, I’m thinking of it and all of the other libraries I’ve cherished throughout my life. 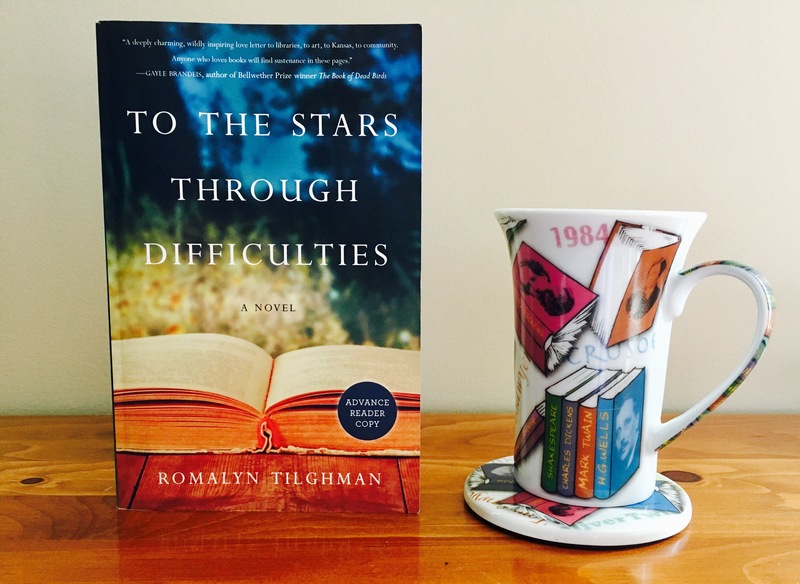 That special connection we form with those buildings is the backbone of Romalyn Tilghman’s debut novel, To the Stars Through Difficulties. To the Stars Through Difficulties introduces us to three very different women who find themselves working to save a struggling arts center in New Hope, Kansas—a building that was once one of the 59 libraries Andrew Carnegie funded in Kansas at the beginning of the 20th century. Angelina, a PhD student whose ten-years-and-counting thesis on the Carnegie libraries is quickly reaching its time limit, arrives in New Hope looking to find the missing piece she needs from the building that inspired her love of libraries. Traci, a newly appointed artist-in-residence, fears that the first place she’s found that truly feels like home will be taken from her at any moment, once the town finds out about her padded resume. Gayle has lost everything due to a devastating tornado in her neighboring hometown and joins the quilting guild at the arts center, helping the cause and maybe her own peace of mind. With long-lost journals, family secrets, and the strength of their foremothers at the novel’s core, To the Stars Through Difficulties is a story of hope, redemption, ties to the past, and new beginnings. I love novels about the strength of women, and one of the things I love most about this novel is how it exemplifies that strength can mean different things to different people, and can be found in many ways. Each of these characters faces her own unique challenges, and I was invested in each woman’s journey throughout. Romalyn Tilghman does a wonderful job of seamlessly alternating between the three distinct points of view, and she also captures the spirit of the entire vibrant community surrounding them. Reading this book, I truly felt that I was living in New Hope, too—that I was a part of the women’s efforts to save the arts center, that I was privy to town gossip and secrets. Not only did I learn about the history of the Carnegie libraries, but as a lifelong lover of all things books, it had me thinking about the special libraries in my life and what they’ve meant to me. To the Stars Through Difficulties is a beautiful debut novel that will have you feeling inspired and full of new hope. It may even give you a hankering to visit a favorite library or discover a new one to explore. It will without a doubt remind you of the magic those book-lined walls hold, and, as readers, I think that’s something we can all get on the same page about. Do you remember your first library? Or is there a library that has special meaning to you? Share your thoughts below as we celebrate National Library Week! For more on Romalyn Tilghman, her book, and what inspired her to write about the Carnegie libraries, visit romalyn.com. I love that cup too! Where did you get it?